The minimum per-piece rate for all third class bulk mail was one cent from July 1, 1928 until July 1, 1952. As of October 1, 1932 each piece was required to be labeled, "Sec. 562, PL&R." On February 25, 1949 this was changed to "Sec. 34.66, PL&R." Other codes were used later, after the minimum rate had gone up. 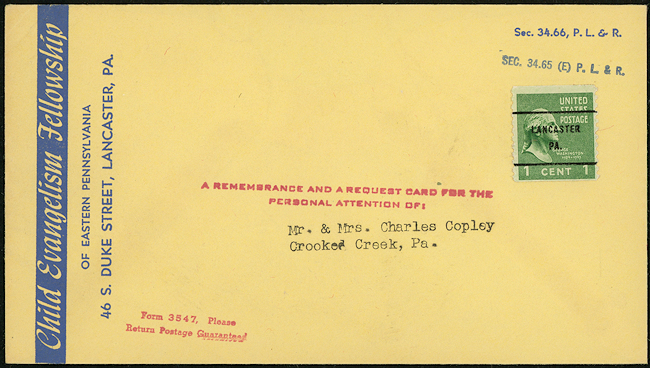 This bulk mail postcard was sent prior to February 25, 1949. The same third class bulk rates applied to territories and possessions. 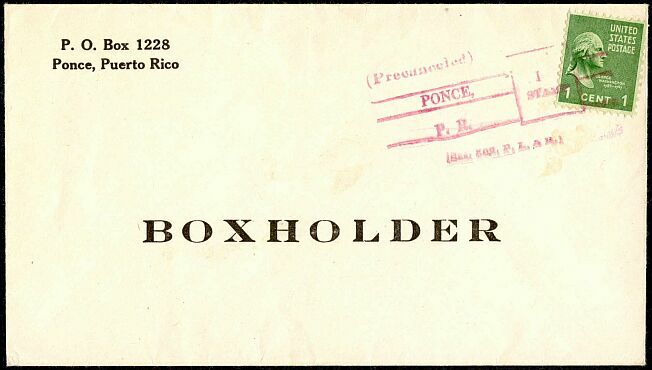 This oddly precanceled one-cent Prexie was used in a bulk mailing to boxholders in Ponce, Puerto Rico. By 1943 the volume of mail being sent to our military personnel starioned overseas was taking too much cargo space. Order Number 19687 of the Postmaster General dated January 7, 1943 placed restrictions on parcels, newspapers and magazines, and prohibited circulars and advertising mail altogether. This bulk mail advertising from Linn's was rejected. The Sec. 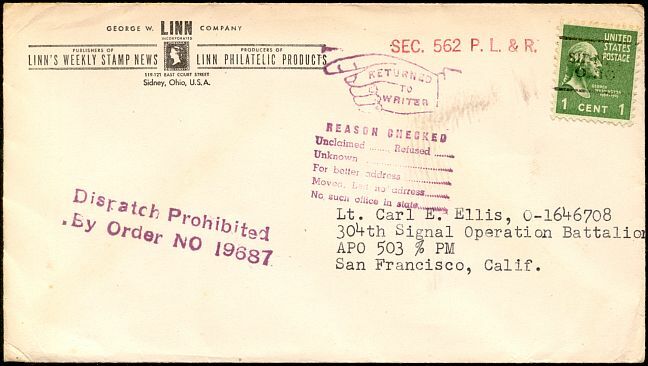 34.66 PL&R designation dates this cover to a time after February 25, 1949. On July 1, 1952 when the regular bulk mail minimum per piece rate went up to one-and-one-half cents a new non-profit bulk mail class was established. Non-profit bulk mail retained the one-cent minimum charge until July 1, 1960. As of July 1, 1952 non-profit bulk mail was labeled "Sec. 34.65(e), PL&R." On July 1, 1954 this was changed to "39CFR 34.65e," and on December 21, 1954, simply "Non Profit Org." 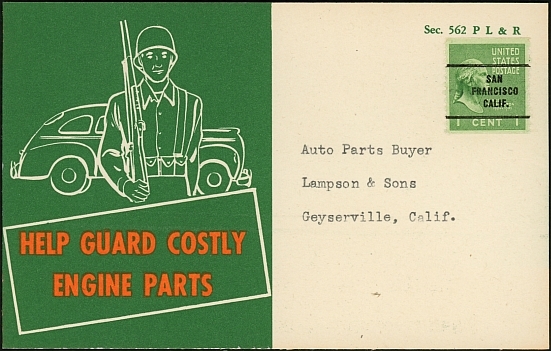 The cover above was printed for use before July 1, 1952, but was not used until after that date. The original Sec. 34.66 designation was superseded by a Sec. 34.65 (e) handstamp. 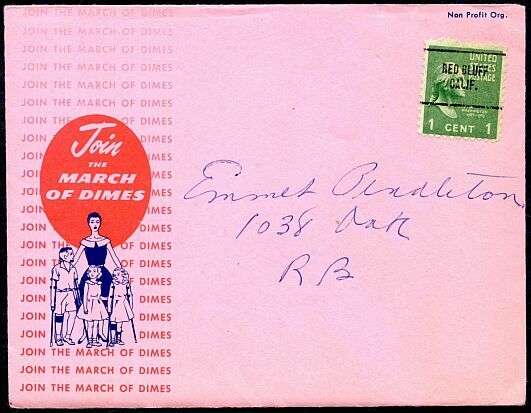 This March of Dimes solicitation was mailed after the December 21, 1954 requirement for identification using "Non Profit Org."